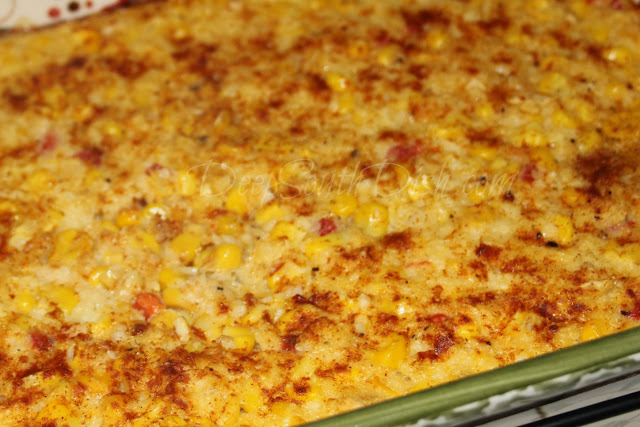 A classic corn casserole made with frozen and creamed corn, cracker crumbs, pimentos, eggs, milk and butter. Corn casseroles seem to have an identity crisis going on in this day and age. There doesn't seem to be a division anymore between what folks define as corn casseroles, corn spoon bread and corn pudding, so much so, that what once made each of these dishes unique from the other, has been completely lost. Because this dish is heavy in corn, but lighter in binders and eggs, I consider it to be a corn casserole. You may know it as something different, but there is one thing for sure. It gets gobbled up. Preheat oven to 350 degrees and butter a 2-1/2 quart baking dish; set aside. Beat together milk, eggs and melted butter; add corn, cracker crumbs, sugar, onion, pimentos, salt, pepper, Cajun seasoning and 1/2 of the paprika. Mix well and pour into prepared casserole dish; sprinkle top with remaining paprika, and a dusting of additional Cajun seasoning, if desired. Bake, uncovered at 350 degrees F for about 40 to 45 minutes or until firmed up in the center. That's it folks - easy and delicious! For more of my favorite Thanksgiving recipes, visit my page on Pinterest! Preheat oven to 350 degrees and butter a 2-1/2 quart baking dish; set aside. Beat together milk, eggs and melted butter; add corn, cracker crumbs, sugar, onion, pimentos, salt, pepper, Cajun seasoning and 1/2 of the paprika. Mix well and pour into prepared casserole dish; sprinkle top with remaining paprika, and a dusting of additional Cajun seasoning, if desired. Bake, uncovered at 350 degrees F for about 40 to 45 minutes or until firmed up in the center. Cook's Notes: I use unsalted butter, but add classic saltine crackers and Cajun seasoning, both of which include salt. If you make adjustments to the recipe, you may need to increase the added salt. THANK YOU, THANK YOU for this and the other two recipes today. 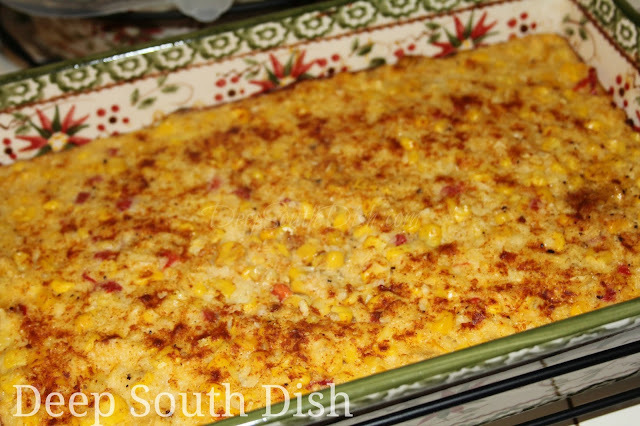 The corn casserole is so similar to my Mom's/Grandma's -that I lost- so will make this weekend. I've tried on my own for years and see what I missed in other attempts. Many thanks for a taste of the past. Oh my goodness - you're welcome! I hope that it turns out to be everything you expected!! Adding that can of creamed corn is the key. I also add 1 tbl of sugar but that is as far as I want to mess with this good recipe. I can't see that a little bit more sugar would hurt Pat! Love corn in anything and I've been looking for a recipe like this. I like the corn spoon bread but I think I would like this better. Will be trying this recipe soon. I hope that you enjoy it Tricia! I always thought corn casserole also had a box of jiffy cornmeal mix in it. Hi June! The answer to that would be, not necessarily! In fact, I discuss this very issue in the first paragraph of the post above the recipe, where I also explain why I call this recipe a corn casserole. Although I know (and love!) the dish you are referring to, I call that recipe Corn Spoonbread. Hope that helps to clarify! So glad to find this recipe that doesn't use a jiffy box mix! Thanks! You're welcome Kat! It's a delicious recipe & I hope that you give it a try sometime. Just for full disclosure - I have no objection to shortcuts, including using Jiffy in a recipe like this. I'm not so fond of it as a cornbread side, but there's a classic spoonbread recipe that I use it in that is well loved by many of the readers here - pinned more than 14k times! The scratch recipe for that is good, of course, but for me, the Jiffy version is the best! don't you have to chop up the pimento????? I made this tonight as a side to your salmon croquettes and it was wonderful. I have made your corn spoonbread several times and love it but I think my husband wants this one more often now. I really liked the pimentoes in this, I thought they were excellent. I think I'll make a dish of this to bring to my neighbor soon. She would love it too! Thank you for sharing because this was a great dish and very easy to throw together as well. You're welcome! So glad y'all enjoyed it!! I made this at Thanksgiving and my family LOVED IT! Will be making it again for family Christmas Eve! These are all terrific recipes!! can this go in the freezer after it has baked and cooled down?